You read it right: a new locomotive model is available in American OO! I believe that this is the first new locomotive model produced in our scale and gauge since the last runs of sand cast F-3 models from Ultimate in the late 1960s, and it is light years ahead in terms of design. 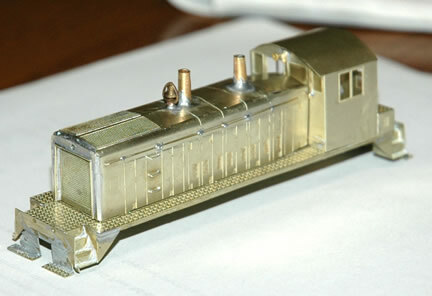 This beautiful switcher model was actually developed as a TT scale model by Worsley Works of England, but as it is an etched model it is just a matter of scaling the drawings up and it can be and now has been produced in American OO. This first photo is from the Worsley Works website of a body in the process of being built up from the TT scale etchings. The money quote they give in their website from a buyer of the TT model is this: "........the more I work on this etching, the more impressed I am with the design work. It has been amazingly easy to build this body kit and so far, I have soldered everything .” It can be built up into an accurate model of an EMD SW8, SW600, SW900, or SW1200. More photos.